Those of you who read my blog know that I absolutely love Skirt Sports. I love their products so much, I'm even an ambassador for them, which is probably the highlight of my entire running amateur career. But how did my skirt obsession get started? As I was about to run 13.1 miles, my costume needed to be comfortable and runner-friendly. I started scouring google for plaid running skirts with built-in capris. 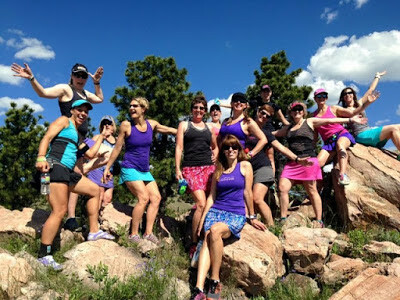 At that time, I chafed so much in shorts that I always insisted on wearing capris when I ran (I didn't yet realize Skirt Sport's amazing anti-chafe technology). And, if I could find this skirt with pockets to hold all my on-the-run necessities, all the better. I searched and searched and finally, on a discount clothing website I found a plaid running skirt with built-in capris: Skirt Sport's lotta breeze capri skirt in Abernathy print. Not only was it plaid and with capris, but it was loaded with pockets! I was ecstatic! I ordered the skirt right there and hoped that it would arrive before my race later that week (yes, it took me that long to decide on a costume). Unfortunately, the website I ordered from messed up my order and it didn't ship in time, so I resorted to searching for something that would do at a thrift store. Which was hot, itchy, and chafed me in places I didn't know could chafe. But at least I had a costume and painted my face blue and was able to shout ,"For Freedom!" at the runners going in the opposite direction. Anyway, since I wasn't going to use the Skirt Sport skirt for my costume, I intended to return it once it got in. Or so that's what I thought I would do. My package came in, and I decided to just see what the lotta breeze capri looked like in person. I was impressed. The material was soft and breathable, and it looked even cuter in person. I decided to then just try it on and see how it looked, and once I did that, it felt so comfortable (and looked so good on me) that I thought, "What the heck, let's take it for a test run." That first run was a five-miler around my dad's house. The capris stayed put and didn't ride up my legs. The pockets and headphone port made it so that I didn't have to wear a bulky armband or carry my keys in my hands! And a bonus surprise, this skirt has a thick waistband which kept my postpartum stomach tucked in and prevented bouncing. I even felt modest with the skirt covering my booty. 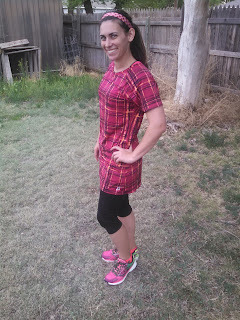 This led me to purchase another skirt/capri combo for my upcoming race, mostly since the red of the Abernathy print didn't match my shoes as much as I wanted. Yes, yes, I know. I need to feel THAT coordinated. So I bought the jette capri in gotham print. After all, black and gray go with everything. At the halfway point of the Big Sur Marathon on the Runner's World Challenge team. 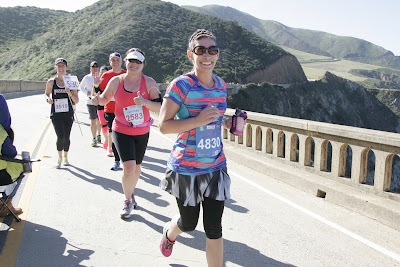 The jette capri carried me through my first marathon, Big Sur. You can read more about my experience at the Big Sur marathon here. I think that was the first race I ran in my new skirt. I trusted it enough to get me through 26.2 miles of mountains, winds, and a scenic wonderland. It didn't let me down. I didn't worry about fuel since my pockets were stuffed with Gu's. I didn't worry about chafing since everything was held securely in the skirt. I didn't worry about anything except getting over the next hill and finishing before the course cut off. And I didn't worry about looking good in my race pictures; I knew that wouldn't be a problem! The only thing I worried about was surviving all the crazy mountain inclines--which I did do. The entire marathon, my skirt performed beautifully, and from then on I was sold. I felt tight, secure, and pretty in that outfit...and I wanted more! Well, I got more. Just about an entire dresser more as a matter of fact. I found the actual Skirt Sports website and slowly started replacing my previous apparel with Skirt Sports. 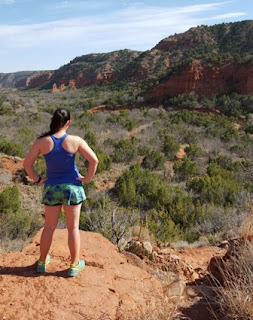 When I found out that I could run in the shorter skirts and shorts and not chafe, I started alternating my capris with the vixen, gym girl, jette, and lioness skirts. Boy, are they nice to wear on these hot Texas summer days! Needless to say, all my workout clothing from my bottoms to my tops are Skirt Sports. I love the fit, I love the pockets, I love the feel, and I love how I look in them.